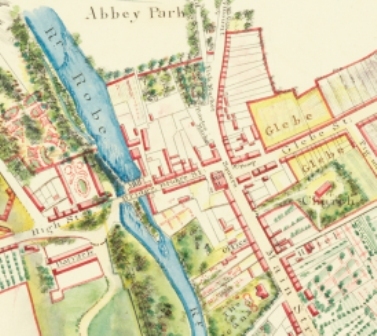 While researching the Ballinrobe Diaspora I came across the name Edward Jennings d.1889 and on further research discovered he was born in Ballinrobe c.1820. At some stage he joined the British Army and was eventually an Irish recipient of the Victoria Cross, the highest and most prestigious award for gallantry that can be awarded to British and Commonwealth forces. "On the 10th May 1889 Edward Jennings VC, was buried in a pauper's grave, unmarked and unattended, one of 190,000 bodies interred in Preston Cemetery, North Shields, North East England. For most of his life Edward Jennings was employed by the local council as a road sweeper and must have fallen on hard times because he sold his Victoria Cross to a private collector. A memorial service and the placing a headstone on Edward Jennings grave took place at 2pm Wednesday, 10th September 1997 in North Shields. The service was attended by members of the 7th Royal Horse Artillery and 101 Royal Artillery, other dignitaries included the Vice Lord Lieutenant, the North Tyneside deputy Mayor Councillor Arlene Richardson, and a number of other associations were represented. Three buglers and a piper were present and a volley of shots were fired over the grave. The headstone was the result of an appeal launched 4 months earlier to raise the necessary £2000. The whole service was instigated during an exhibition on VC winners held at the Newcastle Central Library earlier in 1997. The exhibition organiser was Phillip Pike of the Victoria Cross Commemoration Society and he was contacted by Edward Jennings' great-granddaughter, Mrs. Kathleen Lough, who lives in New York, North Tyneside. Mrs. Lough, her brothers Brian and John were united with a distant relative, Martin Jennings, 79, who travelled from County Mayo, Ireland. The family presented a citation of the VC to North Tyneside Council." London Gazette, 24 December 1858 - Relief of Lucknow, India, 14 November to 22 November 1857, Rough Rider Edward Jennings, Bengal Artillery. This page was added by Averil Staunton on 14/06/2011. I would like to know if Edward Jennings was an ancestor of my great grandmother. Her maiden name was Mary Jennings and she was born in 1858. 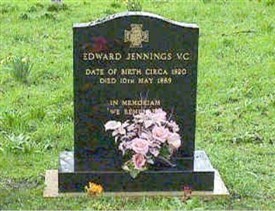 For what its worth, my mothe,r one of the Joyces from Kilbride told me that Jennings VC came from the wood in Kilbride. She said that his family were evicted and their house destroyed. During the eviction he killed one of the bailiffs or one of the RIC men protecting them. He managed to get away to England and later joined the British Army. He was sent to India where he later earned a VC for saving the life of an officer. Someone from a Newcastle local paper did write a letter addressed to James Jennings of Kilbride asking did anyone know about the family around about 1970s I think . But the only Jennings left in Kilbride was a different family and never bothered to reply but he gave the letter to my mother a few years later and she told me the story about one of the first VC medals awarded . I am also looking for any relatives of my great great grandfather E. Jennings as I would like to go to his home town one day. I am trying to find out if Edward Jennings was my grandmother's uncle. Her maiden name was Harriet Cork, her mother was called Ellen Jennings. REPLY: I have copied your query on to South Mayo Family Research Centre who handle all genealogical queries & will e-mail you their contact details. Is there any other information in regards to Edward's family eg. who he married, children, etc? I do appreciated this article.